Making an offer on a property is a big decision that can lead to a tense, anxious time while a buyer waits to here if they have secured the house or apartment that they desire. However, there are some steps that buyers can take to minimise these frustrations while buying a house or apartment. Doing research on the current property market, knowing their own budget, starting negotiations quickly, getting a property valuation and survey done and exchanging contracts in a timely manner can all help buyers lower their anxiety levels about making an offer on a property. When you start looking for a house or apartment to buy, do your research about each and every property market that you are interested in. Find out about benefits and drawbacks of specific neighbourhoods and communities, know the selling prices of similar properties in the area and mark down any issues that you might have with a particular property which you think would affect your offer. Remember, you are buying a house, not making new friends so while it is best to stay polite and cordial throughout the process it is also important to line up your facts to support your offer. Once you have a feel for how much you think a property might be worth, calculate how much you can afford to spend on the property. It usually helps to come up with three numbers: the least you can spend on the property, the most you can spend on the property and the happy medium that you will be willing to spend on the property. Visit a variety of mortgage providers to find out more about how much you might be able to borrow for buying a house or apartment. Most initial offers are made over the phone or otherwise verbally, so these offers are not usually legally binding. However, if you put an offer in writing make sure that the phrase “subject to contract and without prejudice” appear on the page. This means that you can back out of the offer prior to signing contracts related to the property if you need to do so later in the process. During this initial offer it is also wise to state any changes to the property that you might desire, such as a new roof or a replacement appliance. It is well within the seller’s rights to reject an offer and/or any stipulations, but it is also well within a buyer’s rights to ask for the deal with which they would be most pleased. However, buyers should beware of making an insultingly low initial offer as this method of negotiation could backfire and they could lose a chance at the property for no good reason. Once an offer has been made and verbally accepted getting a property valuation and survey done is imperative. A valuation lets a buyer and their mortgage provider know how much the property is worth while a survey lets them know the condition of the property. If either the valuation or survey turns up some unexpected information then a buyer may want to revise his or her offer in line with the new information. When both parties are happy with the offer and the property contracts can be exchanged in order to formally begin the sale process. A word of warning, however – until contracts are exchanged both sides have the ability to pull out of the verbal agreement. When a seller pulls out because (s)he has accepted a higher offer this is known as gazumping. 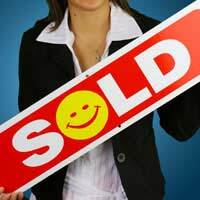 There is no recourse for buyers who fall victim of gazumping, but sellers and estate agents who engage in this practice can acquire a bad reputation if it is made known. Making an offer on a property to buy can be a nerve-wracking experience. Buyers who are thinking about making an offer on a property should always do their research about the property and line up a solicitor who is experienced in conveyancing so that they can feel more confident about the home buying process that they are about to start. Quiz: Are Your Property Expectations Realistic? Questionnaire: Are You Ready to Buy a Property?